Signode manual hand tensioners allow operators to bring strap to desired tension with minimal interruption, effort and strapwaste. 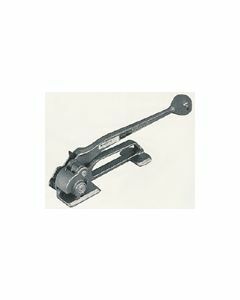 Most tensioners have a base which goes under the strapping and rests on the flat surface of the object being strapped. For smaller or irregular bundles, a push-type tensioner, which has no base under the strap, is recommended. 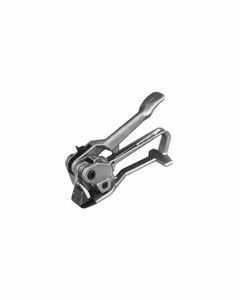 Feedwheel—for general use - The feedwheel tensioner has a serrated feedwheel which engages the strapping firmly. There is no limit to the amount of slack it can pull out of the strap. Fast and easy to use, it requires the use of painted and waxed strapping. 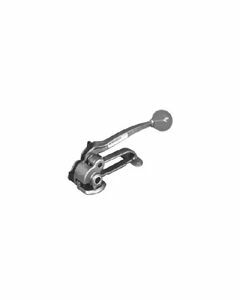 Windlass—for heavy-duty applications - The windlass tensioner simply winds one end of the strapping around a slotted windlass shaft. 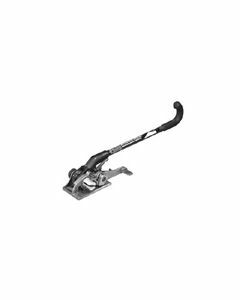 Used with dry, heavier strapping, precut to desired lengths. 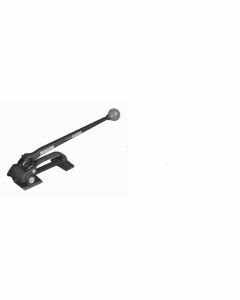 Rack-and-pinion—for heavy round or irregular applications - The rack-and-pinion tensioner uses a serrated gripping dog to hold the pulled strap end. It can be used with either dry or lubricated strapping on round or irregular shaped packages. This tensioner has limited take-up. All prices are subject to change; prices in effect at time of shipment will apply.